UFO SIGHTINGS DAILY: Group Of UFOs Over In Henderson Nevada On June 3, 2016, Video, UFO Sighting News. Group Of UFOs Over In Henderson Nevada On June 3, 2016, Video, UFO Sighting News. 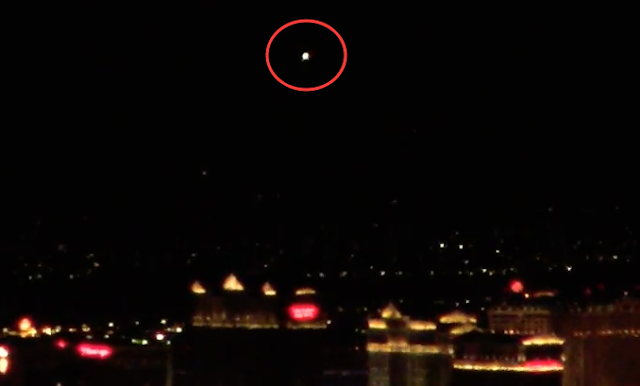 These glowing lights were recorded over Las Vegas last night and there is a high probability that they are UFOs. This is an area near Nellis AFB where a Tall Whites underground base is located. Ships only come and go during the night to hide, but often use lights to avoid planes when close to an Air Force Base. Steven Barone, a UFO researcher in Las Vegas caught these UFOs and believes that aliens frequent the area right below the noses of the people of Vegas. I believe his is correct. I'm glad I was patient enough to stay outside just a little longer last night. Nothing happened for the first hour and a half and it was still really hot so I was getting ready to go inside and chill out. This is a good example of hanging in there because three different events happened. I got some footage of objects in the north valley which led to these ones over in Henderson. While this was happening another event started on a mountain about nine miles from my home. I really like this particular video though because it clearly shows a minimum of three UFOs together brightly lit up. In reality, there were probably quite a few more that just stayed low key. I honestly believe that UFOs are here every single day in one form or another but we just don't see them all the time. I can only imagine how much footage I would have if it were possible to catch everything that happens around here. It would truly be astonishing. US Military Vet worked with Tall White aliens at Nellis Air Force Base, Video, UFO Sighting News.